Microsoft CEO Satya Nadella speaks at the Future Decoded conference in London on Nov. 10. The company hopes to create new social tools to increase productivity in and out of the workplace. 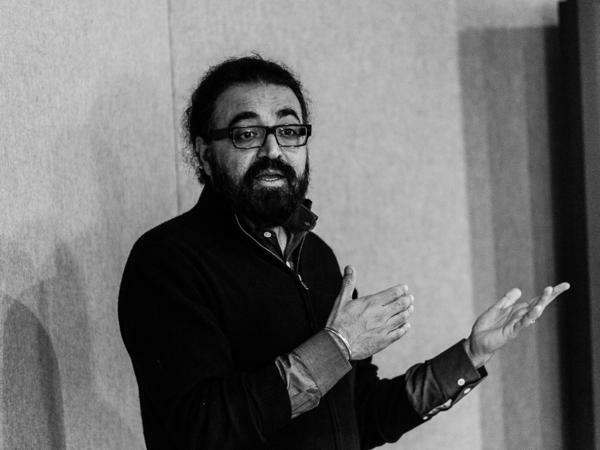 Microsoft's Gurdeep Singh Pall spoke with reporters last week at the company headquarters in Redmond, Wash. He explained how Microsoft would analyze data to figure out a user's priorities. "Microsoft: the social network" is, at first glance, a strange idea. But it makes a kind of sense. While Facebook may have the best map of our personal relationships, Microsoft has the best map of our work lives. "What drives me, is for you to be able to get more out of every moment of your life," says Satya Nadella, Microsoft's new CEO. "You want to be able to create a document, get to a meeting, be productive in the meeting, have your notes taken in the meeting automatically for you." While many companies block social media sites in the workplace, companies pay Microsoft to be on the inside, and to store internal documents, calendar items, meeting notes and attendees, contacts and more. According to a recent quarterly earnings report, more than 1 billion people use Office — that's 1 out of every 7 people on Earth. With just a bit of Big Data analysis, Microsoft could create social tools to help users decide what and who is important to them. "In a world of abundance of computing, the only thing scarce is human attention," Nadella says. "And our job is to be able to help you get more out of those moments of your life." And "those moments" don't have to be just from 9 to 5 — Nadella says he wants users to get as much out of the programs in the personal lives as they do at work. Microsoft is racing to get its web-based version of Office, which is called Office 365, on every smartphone and tablet — which they recently decided to do for free. That way, Microsoft's personal assistant can follow you everywhere and get more personal. For example, it could integrate your GPS location with your to-do list so that when you step inside your home, you get a reminder. "These are the things that I should be talking to my daughter about or showing her these things," Nadella says. "That's the idea — of being able to be contextually aware." Last week, Nadella invited a handful of journalists to company headquarters in Redmond, Wash., to hear the game plan and meet the managers who will make this happen. Gurdeep Singh Pall explains that as Microsoft mines the data, it can figure out your priorities. Say you're about to delete an invite to a party, he says. Microsoft might alert you: "Don't delete it, because this happens to be a company party, and this message was sent to a lot of important people in the company." Julie Larson-Green says that if she wanted to meet with two co-workers who were in different locations, "it can do smart suggestions on where would be best place for us to meet given the time of day, the traffic, the distance between our locations." Microsoft wants these social features to work inside and outside a company's walls, so that when you jump into a meeting with outsiders, you're prepared. Nadella also says his group is firm on the revenue model for these projects. "We're clear that it's about subscriptions," he says. "We want to have a subscription offer, which is for every individual and every organization. And it's not about advertising." Which means no pop-up ads inserted into your next PowerPoint presentation. But Al Hilwa, an analyst with IDC who used to work at Microsoft, says there could be pitfalls if users aren't given enough control. "Using Office 365 can't be like using Facebook," Hilwa says. "That doesn't make sense, and that would be a big problem." Hilwa says that our professional lives are different from our online identities, and that information on Facebook may typically gets shared with everyone, it can't work that way in a workplace. "If users are in charge of controlling what bits and pieces of facts they can let out, as far as their social graph, then maybe I could see how this might work," Hilwa says. A key challenge for Microsoft, he says, will be to figure out how to share discretely, without being creepy or irritating. Microsoft wants to make your work life more social. The company software is already a lynchpin of modern business computing. Think about all those Word documents and Excel spreadsheets and, of course, Outlook e-mail. Well, the company's new management says, they have the potential to mine data from those programs to create social tools in the workplace. The question is will customers want to cozy up socially with Microsoft on and off the job? Here's NPR's Aarti Shahani. AARTI SHAHANI, BYLINE: Microsoft the social network - at first glance, it's a strange idea, but stop and think about it, and it kind of makes sense. While Facebook may have the best map of our personal relationships, Microsoft has the best map of our work lives. SATYA NADELLA: What drives me is for you to be able to get more out of every moment of your life. SHAHANI: Satya Nadella is the new CEO. SHAHANI: While many companies block social media sites in the workplace, companies pay Microsoft to be on the inside and to store internal documents - calendar items, meeting notes, who's in the meetings, contacts. More than 1 billion people use Office. That's one out of every seven on Earth. With just a bit of big data analysis, Microsoft could create social tools to help users decide what and who is important. NADELLA: In a world of abundance of computing, the only thing scarce is human attention. And our job is to be able to help you get more out of those moments of your life. SHAHANI: And those moments don't have to be just nine to five. NADELLA: No, not at all. In fact, I want you to get more done for yourself. SHAHANI: Microsoft is racing to get its web-based version of Office, which is called Office 365, on every smart phone and tablet. That way, Microsoft's personal assistant can follow you everywhere and get more personal. For example, it could integrate your GPS location with your to-do list, so that when you step inside your home, Nadella says, you get a reminder. NADELLA: These are the things that I should be talking to my daughter about or showing her these things. That's the idea of being able to be contextually aware. SHAHANI: Nadella has invited a handful of journalists to company headquarters in Redmond, Washington, to hear the game plan and meet the managers who'll make it happen. SHAHANI: Gurdeep Singh Pall explains that as Microsoft mines the data, it can figure out your priorities. Say, you're about to delete an invite to a party. Microsoft could alert you. GURDEEP SINGH PALL: Don't delete it because this is - happens to be a company party, and this message was sent to a lot of important people in the company. JULIE LARSON-GREEN: ...They can do smart suggestions on where would be the best place for us to meet, given the time of day, the traffic, the distance between our locations. SHAHANI: Microsoft wants the social features to work inside and outside a company's walls, so when you jump into a meeting with outsiders, you're prepared. 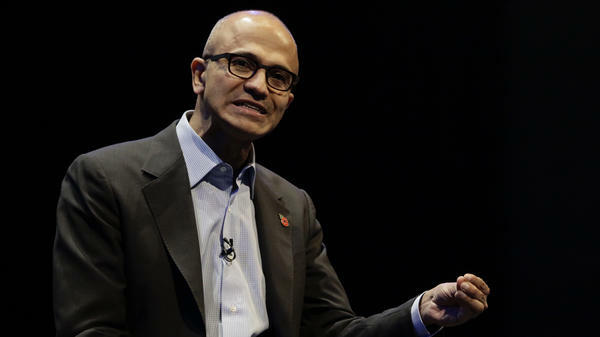 To make money, Nadella says, he won't throw pop-up ads into any Office 365 document. NADELLA: We're clear that it's about subscriptions. We want to have a subscription offer, which is for every individual and every organization. And it's not about advertising. AL HILWA: You just have to be in control. Using Office 365 can't be like using Facebook. SHAHANI: Al Hilwa is an analyst with IDC Research who used to work at Microsoft. HILWA: That doesn't make sense, and that would be a big problem. SHAHANI: Hilwa says, our professional lives are different from our online identities. While information typically gets shared with everyone on a Facebook wall, it can't work that way in a workplace. HILWA: The users are in charge of controlling what bits and pieces of facts they can let out, as far as their social graph, then maybe I can see how this might work. SHAHANI: A key challenge for Microsoft, he says, will be to figure out how to share discretely without being creepy or irritating. Aarti Shahani, NPR News. Transcript provided by NPR, Copyright NPR.